Rediff.com » News » Peshawar attack: Pakistan's 9/11 moment? Peshawar attack: Pakistan's 9/11 moment? Pakistan faces a challenge largely of its own creation and only political processes can correct it, argues Raza Rumi. The attack on Peshawar's Army Public School and the killing of more than 130 children creates a new watershed in Pakistan's battle against terrorism. Maligned globally as a 'hub' of terror, Pakistan has suffered immensely in the past decade. More than 50,000 of its civilians have been killed and over 15,000 security personnel have laid down their lives. Pakistan's policy choices of the past have been far from sagacious and its purported self confessed identity as an Islamic State has not helped matters. More than that it is the curse of geography that has haunted the nation. For 30 years, it has been an active participant in Afghan wars directly and indirectly and the perceived threat from the larger neighbour India is almost an article of faith. December 16 also marks the anniversary of the humiliation that Pakistan suffered when in 1971 East Pakistan with India's support became independent. In 1947 the country's founder called the country he created s 'moth eaten' and 'truncated' and since 1971 the insecurity has only grown. How far is that an imagined construct, how much of it is to continue to run it as a martial State has been subject of unresolved debate -- yet to be resolved. The Afghan policy of the 1980s and patronage to the Taliban movement in the 1990s is part of that insecure worldview. National security has been defined in limited terms and the reliance on non State actors to work as support system for the formal security apparatus remains a policy tenet. Yet there are signs of change. One such shift was the decisive operation against the militants launched in June. Thus far the operation was cited as successful with the regaining of territory and eliminating militant hideouts. The Peshawar attack has all the signs of 'blowback' from that ongoing operation 'Zarb-e-Azb' in North Waziristan agency. A TTP spokesman called it a 'revenge attack' for the army offensive and added that army operated school was targeted because their families had been targeted. The Army Public School is part of the countrywide schools network run by the military. Children of both civilian and military families receive instruction at such schools. Earlier, the TTP used to strike at security checkpoints, police stations, security troops and other targets of military value. Targeting children is a new, barbaric tactic. Having said that, this is not the first brazen attack on civilians. In 2009, the Moon market located in a middle-class neighbourhood in Lahore, was targeted, killing over 60 civilians. In the same year Meena bazaar in Peshawar was also targeted leaving a large number of women and children dead. The total death toll was over 120. Similarly, the attack on the All Saints Church, Peshawar, killed 127 Christians. The most well known attack was the attempt on Nobel Laureate Malala Yousafzai which was done to send a strong message that girls' education was un-Islamic. In the last five years 1,000 schools have been blown up in Pakistan's Khyber Pakhtunkhwa province and the tribal areas. In addition, the Hazara community has been targeted time and again leaving hundreds dead. Mosques, shrines, funerals have also been frequently attacked. Yet the manner in which the TTP targeted children, shooting them point blank, throwing them against the walls and burning alive the teacher is horrific. Most certainly, it has terrorised the Pakistani public and also created shockwaves across the globe. The reaction within India -- humane and sympathetic -- has surprised many Pakistanis. Because the ongoing military operation makes it hard to target military forces directly, the TTP is testing its resolve by targeting children of military personnel. Attacks on these soft targets have a great psychological impact and this is why the army chief rushed to Afghanistan to seek the assistance of the Afghan government and NATO forces reportedly to strike against the TTP leadership living in the ungoverned territories of Afghanistan that border Pakistan. Prime Minister Nawaz Sharif has also shown resolve to fight terror, but this is not the first time he or any Pakistani leader is saying that. There is much to be sceptical about. First, Pakistani politicians have failed to build a narrative against Islamic extremism. In part they want to appease the religious lobbies and view religious references as a means of popular support. The Opposition leader Imran Khan has been asking for negotiations, and even suggested allowing the TTP to open offices in mainland Pakistan. With this level of confusion there is little chance of a coherent political strategy to emerge. Military operations can only have a limited impact. Pakistan faces a hydra-headed challenge largely of its own creation and only political processes can correct it. Second, many of Pakistan's 22,000 madrassas (the number is not known and not all are radical) teach extremism and prepare jihadists. There is no strategy to tackle that. School curricula have undergone revisions since 2006, but in the hardest-hit province jihad is being taught again as the sublime purpose of human existence. How will Pakistan fight the existential battle without tackling this? The unregulated mosque sermons each week air sectarian hatred, bigotry thus influencing millions of minds. The State has given up on basic obligations to stop the misuse of loudspeakers and curbing hate material. Third, sectarianism is a threat to social integration and the armed militias aiming to contain the second largest Shia population in the world are allies of the Taliban and Al Qaeda. The truth is that they have the backing of elements within intelligence agencies and the politicians are scared to contain them. In the late 1990s, Sharif in his second tenure as PM cracked down on the sectarian networks. There were attempts on his and his brother's (who rules Punjab province) lives. Since then they have followed a policy of accommodation and even forging political alliances for electoral gains. Fourth, Pakistan's security matrix has India at its centre and containing its influence in Afghanistan is a paramount objective. Therefore, the Afghan Taliban that have links with their Pakistani counterparts are hard to deal with as they serve a strategic function. Until India and Pakistan resolve some of the disputes and build trust this is likely to continue. Fifth, the Indian government under new Prime Minister Narendra Modi wants to retain a tough line on Pakistan. This is largely for domestic consumption, but is also linked to Pakistan's alleged support to the Kashmir jihad and the Mumbai attacks hangover. There is a gridlock situation. You can't improve regional cooperation until these two countries talk to and face each other and the regional dynamics would not allow these countries to reach that stage. Public opinion in Pakistan demands action. It wants the civilians and military to cooperate and find a way out. Sensing the mood, Imran Khan has ended his four month-long agitation against the Sharif government for electoral rigging. He wants to be seen as part of the consensus against terror. This is a notable shift. Is this Pakistan's 9/11 moment? The next few weeks will tell. 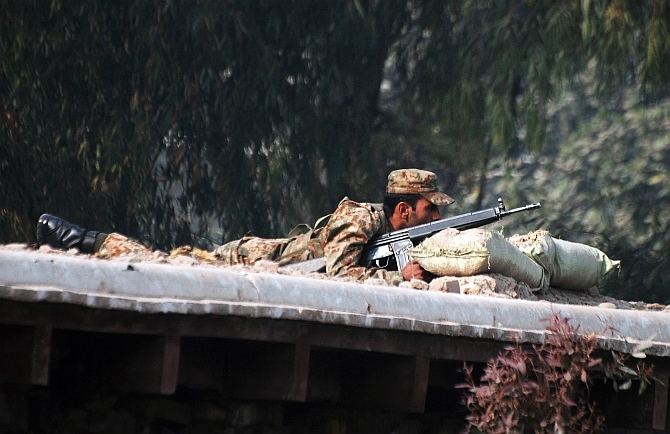 Image: A Pakistani soldier takes up a position above a road near the school. Raza Rumi is a consulting editor at The Friday Times and a Senior Fellow at the United States Institute of Peace. Honda City, Verna or Maruti Ciaz: Which is the best sedan?